MOCA’s Constant: How To Engage Community? 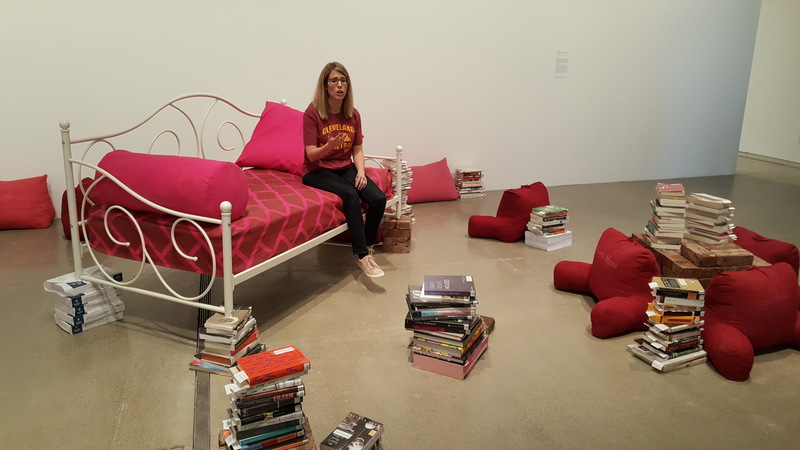 If you look at MOCA’s Constant as the Sun as a way to see what is going on in the region’s art world, you would see a sampling of wildly disparate practices. From straightforward documentation to generative exercises in community engagement, to quirky metaphor, the 10 individuals/collectives are all over the map in their motivations, their media, and their concepts. If you wanted to say co-curators Megan Lykins Reich and A. Will Brown hold up a mirror to the region to show us ourselves through the eyes of community-engaged artists, you’d have to acknowledge there are 10 different mirrors, pointed in all different directions, some of them flat—offering stone cold accurate reflections—while others offer a curvy, fun house view. The diversity of perspectives is a great strength of what’s billed as MOCA’s third regional group exhibition. Overwhelmingly they tend to show the complication, the failures and the mess, alongside the beauty that people make of it. Maybe the most personal of these is the first you see. 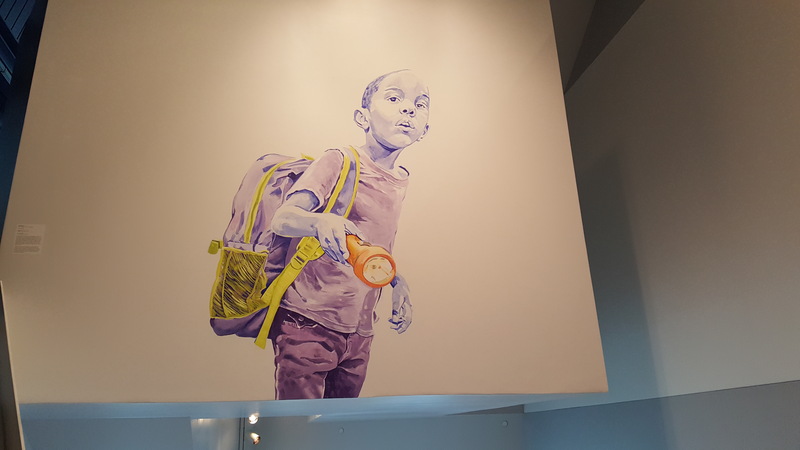 Climbing stairs toward the gallery, you can’t miss two murals by Darius Steward: His son, carrying a backpack and flashlight, and his wife carrying his daughter, larger than life. Steward’s skill at handling paint deserves some time, even if he has said that technique is only a tool, a way of drawing attention to the subject matter. In recent years, Steward’s work has been commentary on African American life, in the interest in provoking and enabling dialog with overt references: he’s painted men with guns, with their eyes closed, idle children lolling on swings, people holding blank signs which invite viewers to think of something to say. The murals at MOCA are life-affirming images of his family, but not without symbolism. The boy’s backpack, and the woman’s handbag are prominent, like burdens to be carried. And the boy uses the flashlight to illuminate his path. 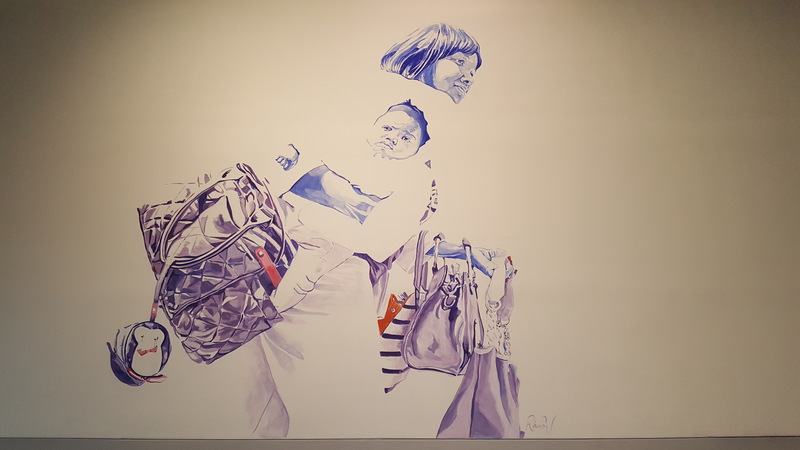 It’s probably safe to say that for most of the people who see these works, they contrast stereotypes: we are bombarded by images that together comprise an institutionalized perspective on Black husbands and fathers who are absent, not working, or somehow painted as irresponsible, even as they struggle against strong currents of racism. These images portray love for the painter’s people, and hope for them, and they are absolutely beautiful. Maybe the least personal work in the show is also the most famous—or at least it comes from the most famous context: mixed media Sculptural works by Tyree Guyton, of Detroit. In his Heidelberg Project, a neighborhood-scale installation there, the artist gathered, rearranged, and re-installed trash to create art, using abandoned houses as sculptural elements or substrates. 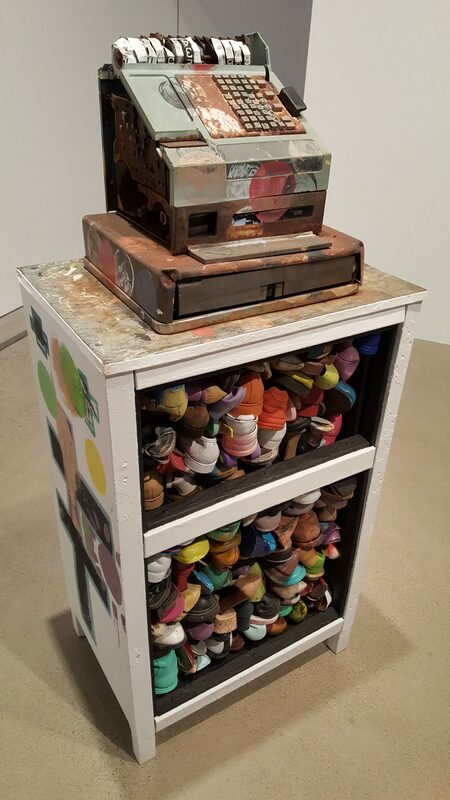 One of his pieces at MOCA, Big Business, is a cabinet packed with colorful old shoes, topped with a cash register, battered beyond repair. It’s hard to think about individual installations or components from the Heidelberg Project, because the whole thing speaks of such large issues: resilience and vitality in the face of predatory mortgage lending, conspicuously wasteful housing construction, policies that encouraged sprawl for generations, and so much more. But this particular excerpt succeeds in a free-standing way, highlighting wasteful consumer culture—the superfluity of shoes—driven by the sculpture’s capstone element, the beat up cash register. And from those elements, Guyton constructed color, pattern, rhythm, a small scale monument over which cash reigns supreme. 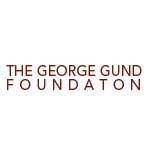 If Guyton’s work makes beauty of abandonment in Detroit, the acerbic collective –Donald Black, Gabriel Gonzalez, and Ali McClain–does that in a documentary way for a neighborhood in Cleveland. 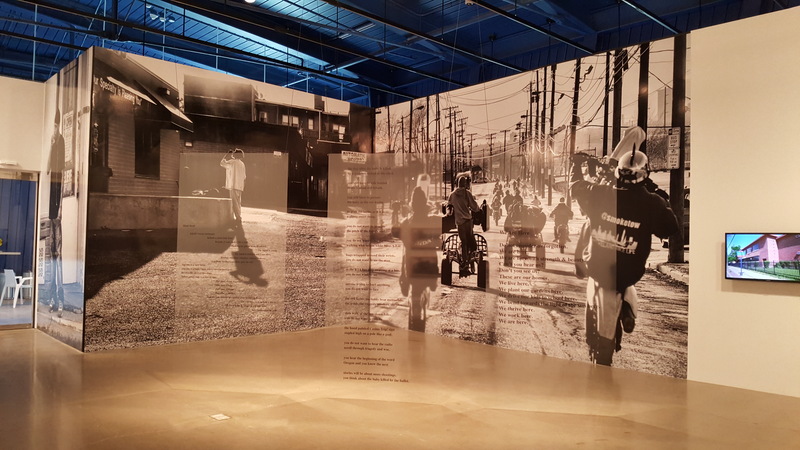 Their installation, Do Not Consider Us Forgotten, consists of large-scale, black and white photos by Gabriel Gonzalez and Donald Black, juxtaposed with poetry by Ali McClain, set large on suspended panels of transparent plexiglass. The photos are imposing, floor to ceiling, covering entire walls. They document scenes from Cleveland’s so-called Forgotten Triangle, a neighborhood beginning at the point where Woodland and Kinsman intersect at East 55th, continuing East between those streets. They show scenes of daily life in a place where, if you don’t live there, you’ve probably never been. One photo by Gabriel Gonzales shows a man smoking, one ear bud in his ear, the other dangling from the wire. Another by Donald Black shows maybe 15 people riding dirt bikes and ATVs down a city street, the loose line of them shrinking as they approach (but don’t reach) a vanishing point, along with ranks of phone poles, all strung together with power lines. Even if you don’t know the neighborhood, you’ve probably heard the local newscasters talk about dirt bikes in the city– whether they are a problem for the police, or whether they are a way for people to stay out of trouble. If these were White folks in Medina, everyone would immediately understand dirt bikes and ATVs as good, clean outdoor fun: a sport. The news stories tend to focus on other things, especially that the police can’t catch them. The subject fuels a debate in Cleveland politics. Frank Jackson supports creating a dirt bike track at the Marion Motley Center, at East 72 and Carson–just a little bit south of the border of the Forgotten Triangle. Adjacent to the photos and poetry is a short documentary by Donald Black, featuring interviews with people involved in the “Opportunity Corridor,” which will serve to connect the West side to University Circle in a straight line extending from I-490. It will cut through the Forgotten Triangle, displacing a whole lot of people. Black doesn’t superimpose a point of view in the reporting, but lets the on-camera interviewees acknowledge that people will be displaced from homes as the result of the massive public works project, and that the “opportunity” may not extend to the people who live in the neighborhood. There is no narrator. Instead, people involved in the process talk about what they believe, what they hope, and what they expect might come of it. Documentary has a significant role in Constant as the Sun, and not just in acerbic’s corner. Photographer Matt Eich has been documenting the lives of two Southeast Ohio families for more than a decade. 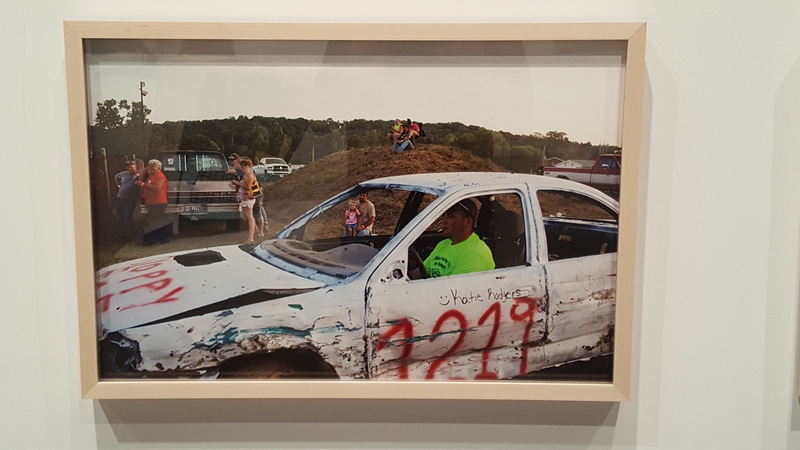 Presented here are compelling scenes of quirky rural life–portraits of people and pets, a demolition derby, Elvis the Zebra. Corine Vermeulen has aimed to capture duality, the tension between utopian visions and the failed systems and places that spawned them. In one photo, a beleagured house—daylight visible through the rafters where a big chunk of the roof is gone, all its windows boarded up, with two signs: one that identifies the decrepit parcel as private property and cautions against trespassing; the other –a hand-painted plywood slab the size of a boarded up window—brands the house an “Imagination Station,” with a Facebook logo and a thumbs-up “like” icon. 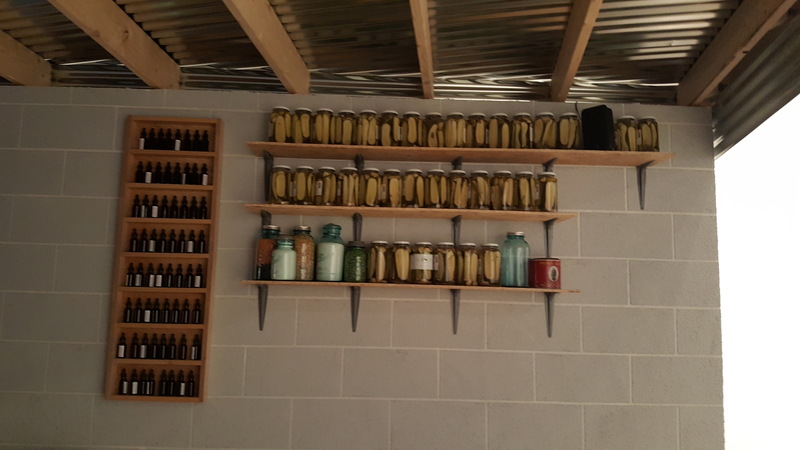 Kate Sopko and Angela Beallor replicated the feel of a bomb shelter, stocked with canned goods, as a venue to evoke the feeling of a “fort” as protection, and where visitors can hear and see a documentary about the viability of survival in a crisis situation by blocking out whatever horror might lurk beyond one’s own control. Recorded interviews tell memories of disaster drills and give people forum to muse on what it would mean to actually need a bomb shelter, and what kind of shelter that would actually provide. A couple of other works in the exhibit approach the struggles of life, relationships, wellness, and needs with dry wit, or performative solutions. Transformazium (Dana Bishop-Root, Leslie Stern, and Ruthie Stringer) is a collective whose past includes such good deeds as helping someone sort through a complicated real estate purchase process, and subsequently the disassembly of a building on the property so that bricks could be re-used. For Constant as the Sun they installed a kind of lounging, relaxing, and reading area where visitors are free to take a rest and read a book. Another collective (Scott Andrew, Agnes Bolt, and Nina Sarnelle, together as The Institute for New Feeling, in collaboration with the Institute for Art and Olfaction) offers Perfume: A collection of Air Qualities, which are scents, customized to reflect day to day realities instead of romantic moods, presented in attractive glass perfume bottles. Danielle Julia Norton’s Talking to Plants “Responds to current feelings of disconnection, and my enduring search for decency,” she says. It’s fascinating to consider the ways artists engage community, or explore the need for community, and the degree to which the work is actual engagement, vs some performative simulation without real impact, or even the simple documentation of reality. Liz Maugans’ installation, The Artists Trust, is one of those cases wherein all the planets aligned: Given the opportunity to create work for a show at MOCA, Maugans–an artist with a multitude of friends who has built a career at Zygote Press by enabling other artists to do their work–decided her contribution to Constant as the Sun would be to give the opportunity to others. 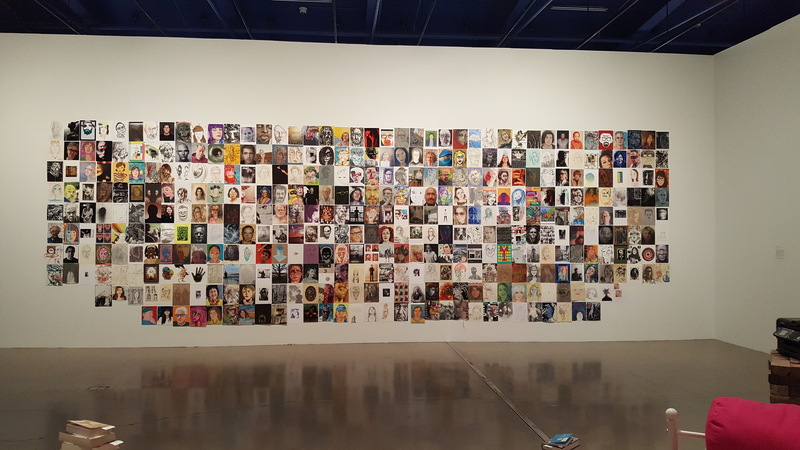 So she put out the call, and something like 400 artists responded by sending in 8.5” X 11” self portraits, in a multitude of media—photos, prints paintings on paper, paintings on canvas, drawings, and more. It’s a “greater-than-the-sum-of-its-parts” situation. There is a documentary quality, in that these portraits represent a broad cross-section of the region’s artists. It’s deep community engagement, in the sense that work you see was created by the hundreds of individuals involved, each given his or her own agency in the whole work. Maugans’ own 8.5X11 portrait hangs on the wall with the rest of them, but the real work is the network–the successful motivation of about 400 artists. Sure, there’s the expressive quality of all those individuals’ works. But what we are really looking at is the collective power of a chorus of voices. The installation is the physical manifestation of a resource, a regional asset, really, the human resource of our artists, which Maugans hopes to make more accessible via a related website linking to all those artists’ own websites. MOCA will ride the wave July 13 with an artist mixer event, during which any artists is invited to meet and greet for free. 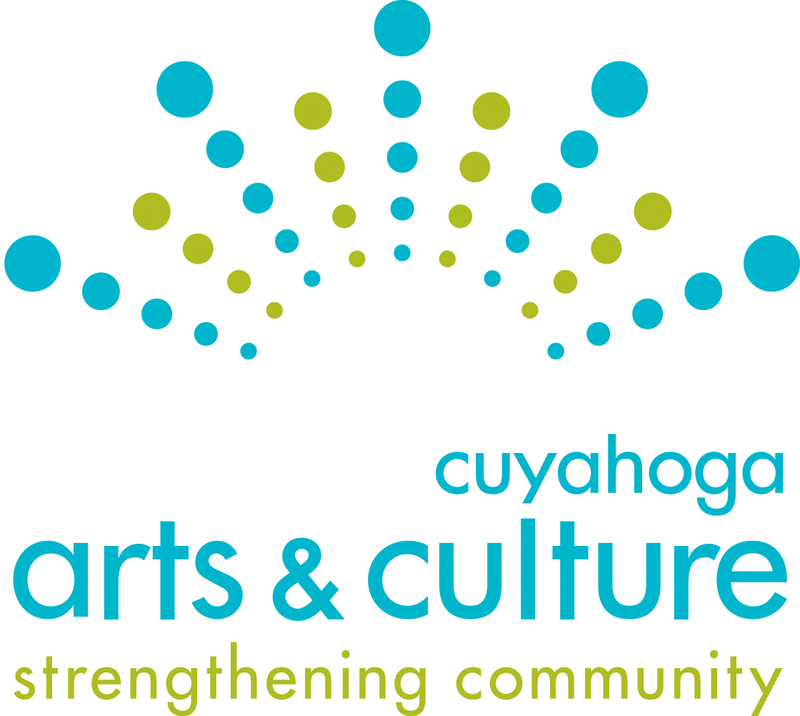 Maugans is inviting public officials, and expects to have representatives from Cleveland city council, as well as at least one candidate in the mayoral race. However that goes, the chorus is still growing. Maugans continues to accept artists’ self-portraits and websites and contact information, which will continue to build the Artists Trust website as a reference and organizational resource.